Microwell DRY GALLERY 300 is a comprehensive solution for managing museum environment. It continuously measures the ambient temperature and humidity level present in the room. Since different collections might have different humidity requirements, DRY GALLERY offers fully adjustable control to meet a variety of relative humidity requirements. DRY GALLERY 300 is an elegant and mobile solution for small exhibition spaces. 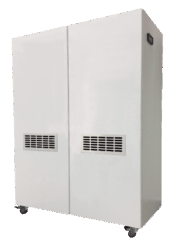 With standard glossy white cabinet-like housing on wheels, it can be easily and non-intrusively placed in any environment. Specially adapted to work in exhibition spaces, the unit is especially quiet and has low vibration levels. Each unit is equipped with 20-litre condensation tank and digital humidistat and thermostat, capable of extracting 36 litres per day. Museum properties, dehumidification of galleries also offices, storage rooms, archives, warehouses, etc.